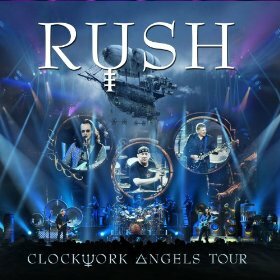 The chunky, double punch of keyboard-heavy “Subdivisions” into “The Big Money” opens Rush’s new Clockwork Angels Tour album. Neil Peart plays as many drums at once as he can (at least it sounds like it) on “Grand Designs.” “Analog Kid” appears halfway into the first disc and “Bravado” and instrumental “Where’s My Thing?” reveal the Canadian trio is on top of their game on their 11th live release. Lifeson picks the opening of Disc 3 with “Dreamline” into Peart’s percussion solo instrumental, “The Percussor.” ‘Older’ Rush fans will surely take to the middle four songs: “YYZ,” “The Spirit Of Radio,” “Tom Sawyer” (Lee sounding a little lackluster vocally here) and a “2112” medley. The hall’s big echo can be heard on a soundcheck recording “Limelight.” “Middletown Dreams,” “The Pass” and “Manhattan Project” end these 11. “Another live album from Rush?,” you cynically query? Yes, I say. And a damn good one at that! Clockwork Angels Tour is pretty much spectacular from start to finish.